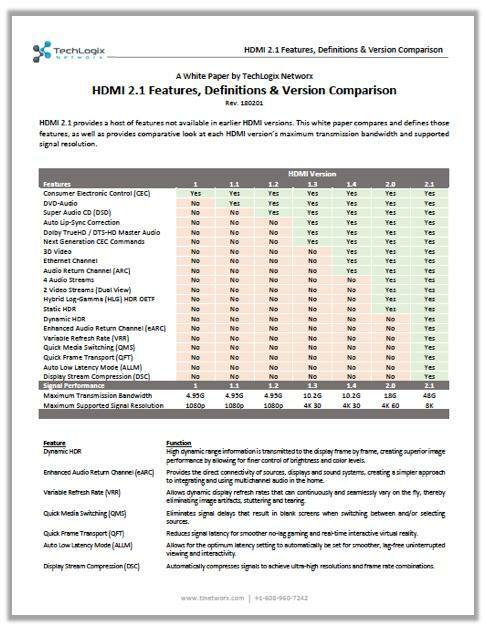 HDMI 2.1 provides a host of features not available in earlier HDMI versions. This white paper compares and defines those features, as well as provides comparative look at each HDMI version’s maximum transmission bandwidth and supported signal resolution. Dynamic HDR High dynamic range information is transmitted to the display frame by frame, creating superior image performance by allowing for finer control of brightness and color levels. Enhanced Audio Return Channel (eARC) Provides the direct connectivity of sources, displays and sound systems, creating a simpler approach to integrating and using multichannel audio in the home. Variable Refresh Rate (VRR) Allows dynamic display refresh rates that can continuously and seamlessly vary on the fly, thereby eliminating image artifacts, stuttering and tearing. Quick Media Switching (QMS) Eliminates signal delays that result in blank screens when switching between and/or selecting sources. Quick Frame Transport (QFT) Reduces signal latency for smoother no-lag gaming and real-time interactive virtual reality. Auto Low Latency Mode (ALLM) Allows for the optimum latency setting to automatically be set for smoother, lag-free uninterrupted viewing and interactivity. Automatically compresses signals to achieve ultra-high resolutions and frame rate combinations.